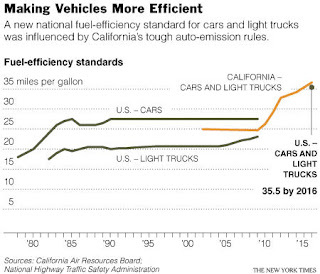 Cap and Trade: Not Dead Yet! After previously declaring carbon cap and trade legislation DOA, CNBC's John Harwood this afternoon discussed its future prospects. The Waxman-Markey climate bill emerged last night from marathon sessions of the House Committee on Energy and Commerce in a largely party-line vote. PM Update: Natural gas prices finished the day down over 9%. Supporting more activity this season are conditions associated with the ongoing high-activity era that began in 1995, which include enhanced rainfall over West Africa, warmer Atlantic waters and reduced wind shear. But activity could be reduced if El Nino develops in the equatorial Eastern Pacific this summer or if ocean temperatures in the eastern tropical Atlantic remain cooler than normal. In the eastern Pacific, the outlook expects an 80% chance of a near to below normal season. There is a 70% chance of storm activity in the range of: 13- 18 named storms, 6- 10 hurricanes, 2- 5 major hurricanes. With oil up 35% year to date to a 6-month high, CNBC earlier today explored the influence of the storm season and other factors on the price of oil going forward (video below). In the short term, the better than expected hurricane forecast, higher than normal inventories, a falling dollar in the face of over $100 billion in Treasury debt to be issued next week, and a dropping stock market are being credited for a decline in natural gas prices of as much as 8% today. On this morning's CNBC Squawk on the Street, Carol Browner, assistant to President Obama for energy/climate change, explains the business impacts of today's proposed fuel economy and emissions standards to honking SUV driver Mark Haines (video below). Midnight update: Added records for West Virginia, Delaware, Pennsylvania, New York, Connecticut, and Maine. MORNING. THIS BREAKS THE OLD RECORD OF 36 DEGREES SET IN 2002. WHICH WAS SET BACK IN 1976. RECORDS GO BACK TO 1879. A RECORD LOW TEMPERATURE OF 35 DEGREES WAS SET AT MARTINSBURG WV TODAY. THIS BREAKS THE OLD RECORD OF 37 SET BACK IN 2002. A RECORD LOW TEMPERATURE OF 28 DEGREES WAS SET AT ELKINS WV TODAY. THIS BREAKS THE OLD RECORD OF 31 SET IN 2002. THE OLD RECORD OF 35 SET IN 2002. DEGREES SET IN 1973 AND 2002. A RECORD LOW TEMPERATURE OF 30 DEGREES WAS SET AT AVOCA PA TODAY. THIS BREAKS THE OLD RECORD OF 32 SET IN 2002. A RECORD LOW TEMPERATURE OF 32 DEGREES WAS SET AT SYRACUSE NY TODAY. THIS TIES THE OLD RECORD OF 32 SET IN 1944. MORNING. THIS TIES THE OLD RECORD OF 32 SET IN 1991. SC YESTERDAY. THIS BREAKS THE OLD RECORD OF 69 DEGREES SET IN 1973. Under clear skies, calm winds, and low humidity, low temperatures in the Mid Atlantic area were near or below daily records this morning. At BWI Airport, the low of 38° was 1° below the Baltimore record for May 19 set in 2003. The low at Washington National of 45° was within 2° of the record for the date of 43° set in 1976. The low of 38° at Dulles Airport was likewise 2° above its record, which was set in 2002. At Washington National, the record low of 43° for the date was set in 1976. Only 2 daily lows for May have been set in the last 30 years, in 1986 and 2002. In all, only 8 of the current daily record lows for May have been set in the last 50 years. The all-time low for the month in Washington of 33° was set in 1906. TODAY. THIS TIES THE OLD RECORD OF 96 SET IN 2008. A RECORD HIGH TEMPERATURE OF 89 DEGREES WAS SET AT SANDBERG TODAY. THIS TIES THE OLD RECORD OF 89 SET IN 2006. A RECORD HIGH TEMPERATURE OF 102 DEGREES WAS SET AT PALMDALE TODAY. THIS BREAKS THE OLD RECORD OF 99 DEGREES SET IN 2008. A RECORD HIGH TEMPERATURE OF 102 DEGREES WAS SET AT LANCASTER TODAY. THIS TIES THE OLD RECORD OF 102 DEGREES SET IN 1954. TODAY. THIS BREAKS THE OLD RECORD OF 103 DEGREES SET IN 2008. A RECORD HIGH TEMPERATURE OF 88 DEGREES WAS SET AT SANDBERG TODAY. THIS BREAKS THE OLD RECORD OF 85 SET IN 2008. A RECORD HIGH TEMPERATURE OF 100 DEGREES WAS SET AT PALMDALE TODAY. THIS BREAKS THE OLD RECORD OF 97 DEGREES SET IN 2006. A RECORD HIGH TEMPERATURE OF 101 DEGREES WAS SET AT LANCASTER TODAY. THIS BREAKS THE OLD RECORD OF 98 DEGREES SET IN 2006. TODAY. THIS BREAKS THE OLD RECORD OF 102 DEGREES SET IN 1970.